Use your head and solve the puzzles in "Aha! I Got It!" Escape Game to escape the room Milo is in. 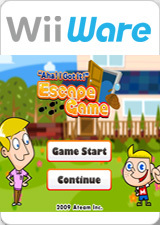 Play alone or with family and friends to solve this puzzling adventure game. Today is Milo’s birthday and he gets an amazing present from his dad - a room of puzzles that he likes to solve. Milo needs to solve all the puzzles to escape from the room. Use the Wii Remote and SHAKE!, PUSH!, TWIST! to interact with, collect, and use items you find in the game. There is plenty to solve using all of the Wii Remote’s tricks and treats. See if you have what it takes to figure it all out. The graph below charts the compatibility with "Aha! I Got It!" Escape Game since Dolphin's 2.0 release, listing revisions only where a compatibility change occurred. This page was last edited on 8 January 2018, at 09:25.